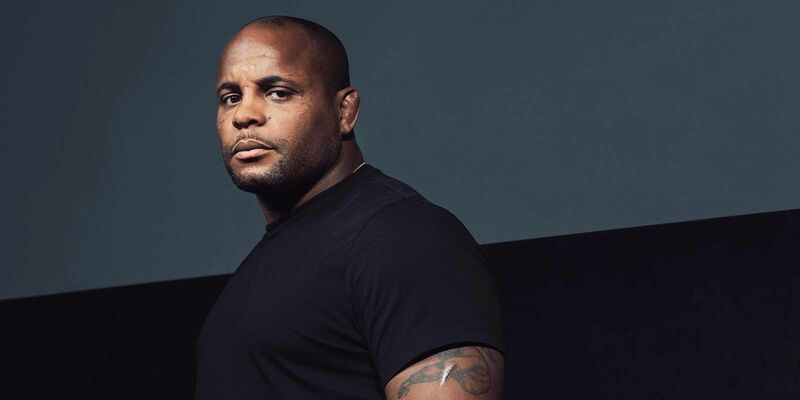 After years of being a footnote to the dominance of his rivals, Daniel Cormier is trying to prove, yet again, that he's a legend in his own right. He is facing a corner of the training room at American Kickboxing Academy -- AKA to its acolytes. From the outside, this gym is just one more tan, soulless warehouse beneath a cluster of palm trees on the outskirts of San Jose, California. Inside, it's a shrine. A life-sized UFC 170 poster of Cormier, bare-chested and sculpted, beckons visitors at the entrance. His gleaming gold-plated title belt hangs over the welcome desk. The full-scale photo of Cormier, arms akimbo, UFC belt draped regally over his shoulder, lords over the training room and the replica octagon where Cormier stands now, on this afternoon in early May. The imagery isn't subtle: He is royalty here. Cormier, as always in this place, has a captive audience. He's still as granite, on an island of his own making while the rest of the gym buzzes. There's his sparring partner, 20 feet away, bouncing and shimmying his shoulders. He's practically dancing, biding his time until Cormier emerges from his cocoon. There's Cormier's coach, stationed on the left side of the cage's apron, gripping the fence, fingers drumming against steel. There's the trio of fighters milling outside, shirtless and shining with sweat, leaning against the training room's tall glass walls, craning their necks, peering into the fishbowl. They're all here to bear witness. To watch for themselves as Cormier tries to scale his sport's mountain ... again. In the far corner, his back to the outside world, Cormier's shoulders slump down, giving in to gravity, or perhaps some other burden the rest of us can't see. His back arches forward, curved like a question mark, then his head drops and finds a resting spot where the two walls meet. He looks as if he's mourning, or praying, or both. He stirs. Cormier straightens his back, lifts his head and turns, facing his congregation. Cormier meets his partner in the cage's center and the two dance around each other -- a flirtation with sparring, at first. They start to trade jabs, the punches landing on each other's mitts. Thud. Thud. Thud. The pounding turns rhythmic, and the cage suddenly has a heartbeat. Thud. Thud. Thud. Cormier dodges a left to his face and backpedals. His coach approves. "Nice!" He prowls forward and launches his right leg, firing a swift kick to his opponent's body. "Go, DC!" And then he goes. He bolts. Cormier chases his prey to the cage's edge and unleashes his left leg. The kick -- fleeting, furious -- is a blur, like light trails on a highway. Cormier's leg collides into jaw. There's a hollow thwack, and then the fighter's back goes rigid, his body bracing for what it must already know comes next. His knees bend, he teeters back and he collapses. For a moment, it's as if there's no oxygen left in the room. No air to find words, just a flurry of wide-eyed half-thoughts. Cormier breaks the spell first. "Oh s---! Come here! Come look at him!" His sparring partner lies flat on his back. He's still. And he's unconscious, letting rip a steady, tinny snore. "Honestly," says Javier Mendez, Cormier's coach and AKA's owner, "that's one of the worst knockouts we've ever had here." Mendez's appraisal is jarring: Cormier is violent. He is 39 years old. His hair is closely shorn and receding, and has been for years. His gray Oklahoma State tee strains against his bulk, extra weight that can only be described as the beginnings of a paunch. Today, like most days, he is covered -- long shirt, long pants -- an outfit that looks practically Amish compared to those of his younger, fitter counterparts, the ones who strut around AKA with no shirts and tight shorts and oh-so-little self-consciousness. He looks like those fighters' father more than their foe, so it's easy to forget -- Cormier can inflict real, startling damage. He has never really looked the part. The first time Cormier's manager, Bob Cook, saw him in person, Cormier was wrestling in Las Vegas at the U.S. Open, the sport's preeminent annual tournament and Olympic launching pad, more than a decade ago. Cook showed up with his business partner, DeWayne Zinkin, to recruit for the fertile wrestling-to-MMA pipeline. They were in Vegas to scout another wrestler, but Zinkin -- a former NCAA All-American wrestler himself -- singled out Cormier. "He's going to be a really good fighter." "Who?" Cook asked. "The short, fat guy over there?" Cormier jokes that, to this day, he's the only fighter who earns applause for the simple act of making weight. 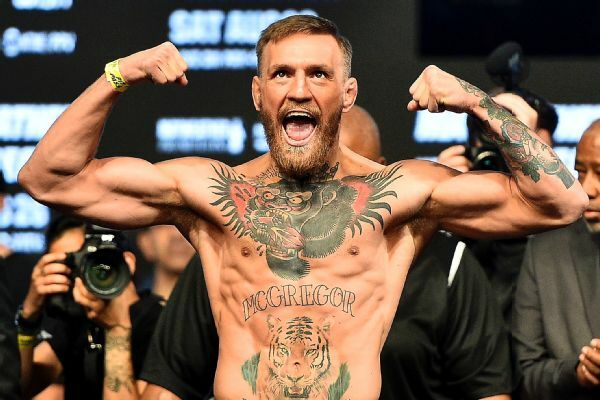 Even now, after nearly a decade in this sport and three successful light heavyweight title defenses, there remains an element of surprise, even incredulity, that he can do this -- fight -- and do it so well. Who? The short, fat guy? And then there's this, his personal hamartia: Daniel Cormier has never beaten the one man he has lived to conquer. Twice he tried to defeat Jon Jones. Twice he failed. Whispers rose to a cacophony -- paper champion, Jones also-ran, emperor exposed -- all that he had done, drowned out by the noise of all that he had not. In the end, he was left to grapple with a crisis of faith. He tried and failed, then tried and failed again. Much of the public decided they'd seen all they needed to see. He's a great athlete who came along at the same time as the greatest. Can't he just let it be? Cormier shakes his head at the notion. No, no way. "I still believe I can win," he says. "That's the problem." 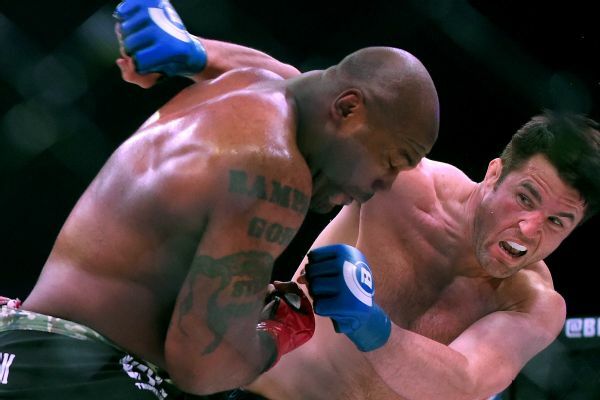 Now a reckoning waits against UFC heavyweight champion Stipe Miocic on Saturday in Las Vegas. Cormier never found a way to beat Jones, the man many consider the best light heavyweight of all time, so he'll attempt to do one better: topple Miocic, the best heavyweight ever. For the first time in five years, Cormier will return to the octagon as a heavyweight, and if he leaves it victorious, he'll be the second simultaneous belt-holder in UFC history -- joining Conor McGregor -- and the first to claim light heavyweight and heavyweight together. Cormier has one more chance to prove he has nothing left to prove. "To truly look back and say, 'Man, I've done everything and I'm totally happy with everything that I've done?" he says. "I need to win. I need to beat Stipe." With nine weeks to go before UFC 226, the early returns are promising. He has put one fighter to literal sleep and sent the replacement crashing to the ground too. Two days earlier, in a different sparring session, Cormier kicked an opponent so viciously the man simply refused to stand up again. "That wasn't that hard!" Cormier yelled. "That wasn't hard! Get up!" He still trains as if he has never won a fight, and perhaps that's because he has never won the fight. He sweats in places you didn't even know were possible -- dark stains blooming on the knees of his sweatpants, the elbows of his long-sleeved shirt. Complacency makes him itch. After he has knocked out his first sparring partner and manhandled his second, Cormier stays cageside to watch Deron Winn, unbeaten in his fledgling career, step in to spar. "You are losing if you fight like that," Cormier yells. The protégé's hands aren't high enough. His feet aren't quick enough. "Your undefeated record? Gone! I wish I was undefeated still! Used to feel good." Sitting on the training-room floor at AKA, Cormier catches Javier Mendez's eye and waves, slicing his hand through the air. No more, he's pantomiming. Winn is tired today, he's not focused, and Cormier knows it. He wants Mendez, sitting on the other side of the cage, to stop the fight. Winn is something like a favorite son to Cormier at AKA, which means Cormier is either watching him like a hawk or needling him. Just a few days earlier, while Winn grappled with another fighter, Cormier stood in the upstairs corridor, overlooking practice a floor below, barking orders. Winn, still tangled with his partner on the training room's fire engine red floor, looked up. "I swear to god, I know how to do this," he yelled. "Then why are you doing it wrong?" Cormier screamed back. Most days it's good-natured ribbing ("Why do I have such a disrespectful kid!" Cormier laments at one point), but when Cormier has Mendez call off the sparring session, Winn is incensed. Cormier jumps in to talk him down, then winds up chasing Winn, who's uninterested in a lecture, around the cage's perimeter. It's like looking into the future. Cormier has vowed not to fight once he turns 40 next March. What comes after will look a lot like today, as Cormier pushes and prods and hovers. In truth, he straddles this line already. He exists somewhere between coach and demigod at AKA. He yells constantly, his voice bouncing off the walls, barking a steady stream of nonsense merely because he wants to be heard. Hey, who's the Cap! Call me Cap! I'm el capitan! Look at these toenails. These things are talons! I'm so acquainted with Dr Pepper, I can taste the 24th flavor! I am the author of pain! Cormier's conflict is two-pronged: He doesn't have much time left, but he has much left to do. Especially if he intends to wipe out the images of his lowest moment -- him falling, flailing on the ground, losing again to Jones. "So many combat athletes are heroes, but they go out on their backs," he says. "I don't want to be one of those guys. I don't want to go out on my back. I don't want those images to last forever -- me, last July, over and over again." In a different Sliding Doors-universe, one where the subway door closes and Cormier is the man with his hand raised at UFC 214 in Anaheim, this fight, Miocic vs. Cormier, feels almost impossible. When asked to consider that alternate reality, Cormier squints and looks skyward, conjuring a world -- a less tortured world -- where he overcomes Jones. He never cries in the octagon. He never questions his worth in their rivalry. "Do I go back up to heavyweight?" he asks himself. "Yes. Yes. I go up and fight him [Miocic]. I still do it." To a man, his entire camp echoes that claim. He'd still wind up here, they say, preparing for Miocic. But he would have arrived here by choice, not compulsion. "With the light heavyweight and the heavyweight? You're King Kong," Mendez says. "Absolutely, it would have happened. But he wouldn't have needed to go to heavyweight. Because if he wins, it erases everything." Even when his name is not on the marquee, Daniel Cormier is always, in some way, battling Jon Jones. He still can't watch the end. The kick? Yes, he has seen the kick. The moment his legs go soft, too, when he lurches around the cage like an earthquake just snatched his equilibrium. But that's it. That's all Cormier can stomach. "I can't watch him be called champion," he says. "I cannot watch Jon Jones get his hand raised. Never have." Sitting in his living room nine months after his rematch against Jones, he shakes his head, as if he could will that night away. He can't, of course, even if the UFC record books don't call it a loss anymore. Jones tested positive for an anabolic steroid and so Cormier's UFC 214 defeat did not happen -- it's now deemed a no contest -- at least in UFC annals. There's no erasing it anywhere else. For now, and maybe for good, Cormier is the man who broke in front of everyone. "That's so disappointing," he said as his voice cracked that night last July. He stood in the octagon gutted, newly beltless and with a microphone in his face, and he blubbered. "I don't know, man. I guess if you win both fights there is no rivalry." His team -- Mendez and Cook, Zinkin and boxing coach Rosendo Sanchez -- hates that he was interviewed at all. He was raw and emotional, they say, and more than that, dazed and not thinking clearly. Jones had sent him reeling with that flush, high kick, and then chased him to the corner where he pelted him with fists and elbows until the referee, John McCarthy, mercifully, and maybe a punch too late, called the fight. He was felled and he was concussed, but Cormier does not regret that moment when he cracked, his insides laid bare as clearly as if a surgeon had stepped into the ring and cut him open. He sobbed. He gasped. He broke. He had done it all before. "Look at this!" Cormier says, thumbing through his phone, as he sits in his living room. Behind him, over the mantel, hangs a family portrait -- Cormier, his wife, Salina, and their two kids -- and a parade of saccharine flourishes. ("The best thing to hold onto in life is each other" announces a sign by the doorway.) Eventually, he finds the photo he's after. "Me in the finals of Junior Nationals. I lost. Couldn't keep it together." And to be sure, there's a 20-years-younger Daniel Cormier, shoulders slumped, back arched and curved like a question mark, distraught at the podium. "Wait, check this out!" He scrolls again, back to present day, and lands on a picture of his 7-year-old son. Daniel II is wearing a singlet, he's hugging his dad, and he's grimacing. He had just lost in the quarterfinals of the state tournament. "Look at him. He's so mad he's crying," Cormier says. It's passed down, he jokes, that torment brought on by losing, as genetic as blue eyes or left-handedness. His second loss to Jones, though, felt like more than torment. "It was like a death sentence," he says. He had been scheduled to fly out of Anaheim after the fight, but an airport felt too public, too suffocating. Instead, Bob Cook rented a car and drove Cormier and his family the five hours back to Gilroy, the bucolic patch of Northern California that Cormier calls home. In the weeks that followed, he stayed in bed, in the dark. While his kids went to summer camp, his wife indulged his almost-coma. He watched hour after hour after hour of "Game of Thrones." He'd doze off, startle awake, then watch more. "I've been second so many times," Cormier says. He bends forward, sitting in a dining chair in the den, and leans in a bit, as if he could bring you a little closer to the agony of all those times he almost made it. "So many times. It's crazy. At Junior Nationals. In college. Fourth in the Olympics." Before Cormier couldn't beat Jon Jones, he couldn't beat Cael Sanderson, the best collegiate wrestler in history. As an All-American on the wrestling team at Oklahoma State, Cormier faced Sanderson six times, and lost each match. Cormier was great in his own right, winning six straight U.S. Open national titles and making two Olympic teams, but he was still a footnote to someone else's dominance. Now he wears those shortcomings like scars. One more not-quite-best, one more lash. The loss to Sanderson in the NCAA finals his senior year. Lash. The fourth-place finish in Athens. Lash. The two falls to Jones. Lash. Lash. Do we resent him for those lashes? To some, Cormier will never be an all-time great. "There is a Jon without Daniel," insists Abraham Kawa, one of Jones' managers. "But there is no Daniel without Jon." Whether that's true -- if Jon Jones is truly the UFC's best-ever light heavyweight, it's his wins over Cormier that earned him the honorific -- the disregard that Jones and his camp offer Cormier speaks to a truth. Cormier, right now, remains an annotation to someone else's excellence. Cormier knows his past with Jones is never truly past. He has learned that, and relearned it, for years. It was late August, just a few weeks after UFC 214, when he learned it again. He was starting out on vacation with his family -- Salina and the kids, his cousins and their kids, his in-laws -- and he was just, just, starting to feel normal again. He was just starting to accept his loss. As he sat on a shuttle bus in Hawaii, on his way to the Aulani resort, his phone began to chirp. He looked at the text: Something may be coming down. Then, when he made it to the hotel lobby, the call came from UFC president Dana White. "Jones' steroid test just came back hot," White told him. Cormier doubled over. He made his way to the hotel room. He laid down on the bed. He turned the lights out. He thought he might throw up. "Just physically sick," he says now, nine months later. Here's the thing about Daniel Cormier: He can't stand Jones, can't fathom why he'd squander his talent this way, in this endless churn of mistakes and misconduct. The failed drug tests and the suspicious drug tests and the DUI and the cocaine and the hit-and-run. But he does not shy away from conceding to the outsize footprint Jones has left on his career, either. Of all the wrenching losses he has had to suffer, he calls losing to Jones again the "biggest letdown of my career." Bigger, even, than the 2008 Olympics, when he failed his body, subjecting it to a grueling and dangerous weight cut, and then his body -- his kidneys -- failed him. Jones even claims a piece of Cormier's victories. "I think Jon Jones has made me better than everybody else," Cormier says. "I just haven't been better than him yet." Their paths forever collide, each one offering the other a kind of redemption. For Jones, a return to the sport. For Cormier, a breakthrough to the sport's summit. "You've had relationships where you break up but keep going back to each other? It's like that. I know that it's not good for me, but I don't know if I have the power to completely wash it away. That's how I feel." Can he be great if he never beats the greatest? It's a flawed question, he insists. "I have heard every single thing that can be said about a fighter, right?" he says. "Making his UFC debut. No. 2-ranked guy in the world. No. 3. No. 1. And still champion. And new champion. If you can say that and it's the truth, how can what you have done be any sort of disappointment? So, yeah, I've reached the mountaintop." Is that enough? Should it be? It's another flawed question. In Cormier's entire career, first as a wrestler and then as a fighter, two opponents thoroughly and, to date, without exception, have had his number. Those two men, Sanderson and Jones, were two of the best to ever compete in their disciplines, and there is no shame in losing to them. It should be enough. For Cormier. For us. Cormier is not shattered by his losses anymore, not even UFC 214, but he is undeniably haunted. And like anyone tormented by a toxic relationship, he hasn't yet found his way to peace. "I do believe he cheated. I'm sure he has, and I'm sure he has been cheating his whole career," he says. "But I will not sit here and pretend that he would be the first guy that I ever fought on steroids. I beat all those other guys. I should have beaten him too." Cormier aches for a third try at Jones. Of course he does. Sitting in his living room, amid the clutter of fatherhood and coaching -- a pile of Pokemon cards splayed out on the blue-and-white rug, a dollhouse stashed in the corner by the couch, a box of trophies he'll deliver to the youth club he coaches in his free time -- his next chapter looms. But it's not here yet. This time, he says, he'd get it right. "I'd win the fight. I still think that I can win the fight. There's no doubt in my mind that I'd win the fight," he says. He only has a few months left, and Jones' immediate future in the UFC remains a mystery, so a trilogy simply might not be possible. This time, of all times, their paths might not collide. Still, Cormier's camp whispers three names like a mantra: Stipe Miocic. Brock Lesnar. Jon Jones. Beat them. Then close the door. Cormier's holy trinity: Stipe Miocic. Brock Lesnar. Jon Jones. "I'm willing to go out and do anything to be remembered," he says. 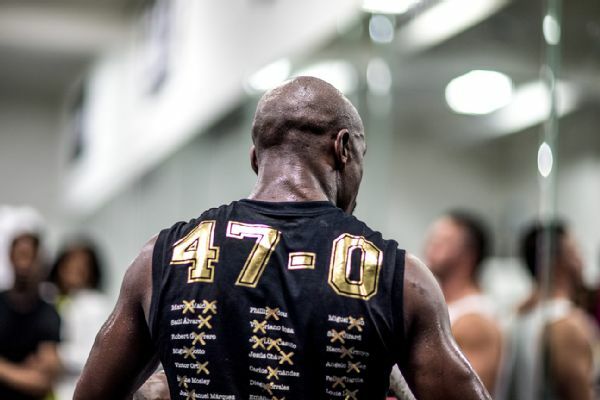 He's either a masochist or the world's most ardent optimist, and it's why, last July, after the fall at UFC 214, he spent the five-hour drive from Anaheim to Gilroy agonizing over how he could salvage his name. How could he get back to Jones? Would he have to move back up to heavyweight to merit a rematch? What on earth could he do to try one more time? It's why he's here, the challenger and substantial underdog, attempting to unseat Miocic. It's why, even after the losses, he isn't lost. "You always think this is the time I actually change the narrative," he says, and bangs a fist against his table. "I change it. Right now. This is where I gotta change it." Hallie GrossmanHallie Grossman is a staff writer for ESPN The Magazine. Follow her on Twitter @TheHallieG.